Held August 15th, 2009, The Mt. Washington Auto Road Bicycle Hillclimb was contested for the 37th time. Defending champion from the 2008 Hillclimb, Phillip Gaimon, with a time of 54:37, won the men's division winner again this year. Sue Schlatter, of Ottawa Ontario, was the women's divison winner, with a time of 1:07:43, a record for the 45-49 year old age group. Phillip Gaimon, 23, leads Kevin Nicol & Ned Overend, above timberline, during the 2009 Mt. 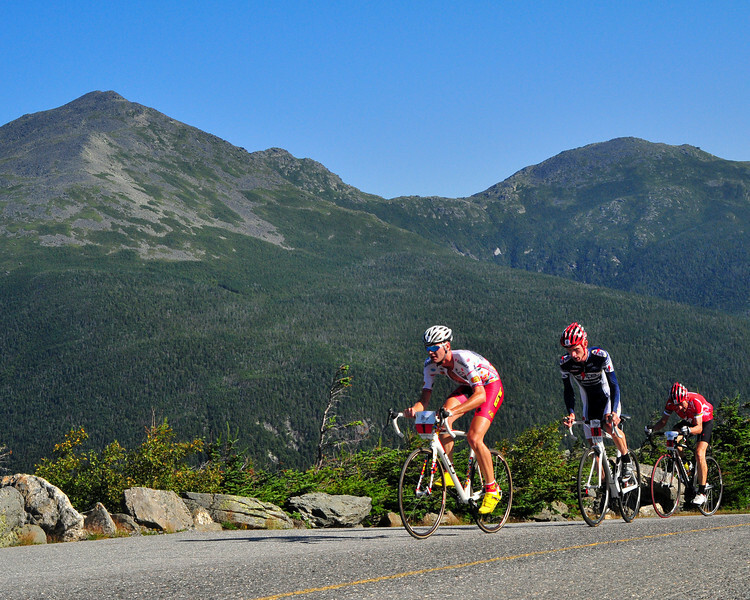 Washington Auto Road Bicycle Hillclimb, held Saturday, Aug. 15th. The Tucker Georgia resident went on to win the grueling 7.6 all uphill race up the 6,288 Mt. Washington in a time of 54:37, 16 seconds ahead of Mr. Overend, of Durango, Colorado, who clocked in at 54:53.